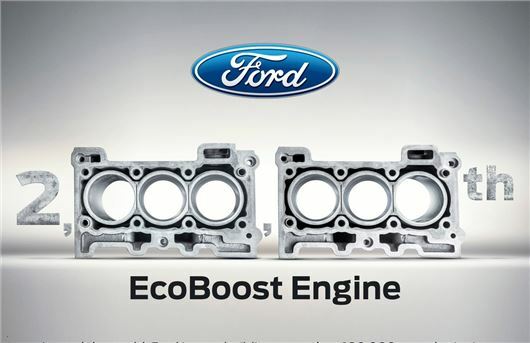 Ford has announced that it has built its two millionth Ecoboost engine. Considering the modular engine range is a mere four years old, this is quite an achievement. But the Ecoboost engine family is growing rapidly, and production volumes are set to blossom in the coming years. The two millionth EcoBoost engine – a 2.0-litre inline four-cylinder – rolled off the assembly line in Louisville, Kentucky under the bonnet of an Escape. But the range now spans 1.0- to 3.5-litres and is produced in Europe as well as the USA. Ford is expanding production of two of its engine lines to keep up with demand. Earlier in 2013, Ford announced that the 2.0-litre EcoBoost would be built in Cleveland, Ohio starting in 2014 and, more recently, Ford said that it will be doubling production of the 1.0-litre EcoBoost in Germany, as the number of cars it's fitted to increases. The turbo-three will also be produced in China at a new Ford engine plant in Chongqing.